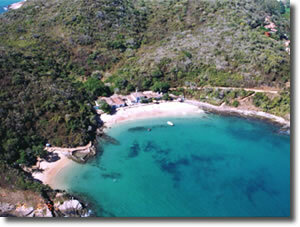 How to arrive: It is located between the two beaches Ossos and Azedinha. 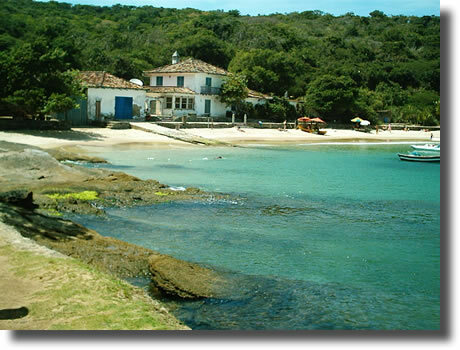 It is possible to be acceded by a close way (about 200 ms) that extends from the end of the Ossos Beach, or in aquatic taxi, always available starting off of the wharf of the center of Buzios or from the own Ossos Beach. 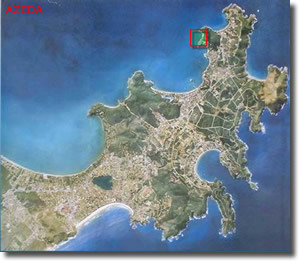 Geography: The Azeda Beach is a small bay of rocky external. With little declivity, surrounded by vegetation within an area of environmental conservation. Oriented towards the west with direct Vista of the sun putting. Characteristics: It is a great crystalline, calm and warm water swimming pool, with golden sand and a sea of green color lemon, and for that reason its name. 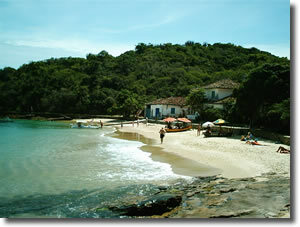 It exists in the beach one old mansion of colonial style, traditional point of Buzios and one of his spread images more. Services: Chiringuito of beach, and anchored boats next of the beach that offer drinks, and appetizer. Rent of equipment for diving (mask and snorkel) and of kayaks. Activities: Banana Boat - Rent of Kayaks.